Liczba stron: 606 Jest to ujednolicona liczba stron, która ułatwi Ci porównanie długości książek. Każda strona Legimi to 200 słów. Tango Argentino was the groundbreaking show that led to the renaissance of interest in Argentine Tango. It premiered in Paris, then conquered Broadway and, later, toured the whole world. 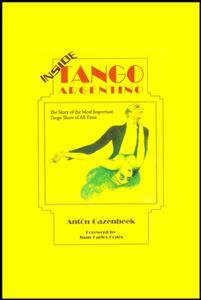 It had enormous cultural influence on the understanding of tango history, music and dance, fashion, hair and makeup.After 7 years of research and writing, tango historian Antón Gazenbeek presents his in-depth book on the history of the show Tango Argentino. The book includes never before seen backstage photographs, memorabilia from the show and fascinating inside stories taken directly from personal interviews with all the surviving cast members. The book has an intimate narration that allows you to be a part of the show’s creation, its backstage dramas and onstage triumphs. This is a book not to be missed! This book is dedicatedtoMr. ClaudioSegovia andhis vision, thelateHector Orezzoli, and toall the artists who madeTango Argentinothesuccess that it was. May their hardwork, talent,and artistryberemembered … forever. A veryspecial thanks also toSergio Segura for all his hardwork, endless supportofthis project,his beautiful graphic design ofthis bookandthemany hours shared interviewing, researching, and preparing this book. Gracias chabon! Thisbookis theresultofover eightyearsofintense researchconductedinBuenosAiresandaroundtheworld. Personal interviewswereconductedwitheachofthe surviving members ofthecastoftheshow, and countless documents,programs,newspaperandmagazinearchives, films,videos,audiorecords,andphotographs were consulted.Thisaccumulatedmaterialconstitutesthebulk ofthesource material for this book. This book reflects howtheevents occurred to the best ofmyknowledge,andnopersonalopinionsonmypart wereincluded.Itisanon-biasedstudyoftheexistingfacts regardingtheshow.Thisbookisintendedtoshow great respecttoeachandevery memberofthecast,both onstage and off. Thetangoalways gives us surprises.Thatayoung Dutch boycouldbesoattractedtothemusicanddanceoftheRio delaPlata,ashashappenedwithhim,seemedstrangeto meand almost asifit was a fable, until onedayI met him personally andconvincinglydiscoveredthattohavebeen borninHolland,withallrespect,wasamistake,asthe tangoispresentinhisentirebody andmindandthat through study,sacrificeandadedicationwhichdeserves fullrespect andadmirationas“work” whichhehasdone fromtheheart, Ihopethediffusionofthisbook willbea successandhopeitwillbeacceptedandunderstoodinits truedimension.AsI,JuanCarlosCopesdo,Iwishhimthe best oftriumphsin all thefacets ofhis tanguero career. Strength, ahugandthathis“message” continues conquering land andadmirers all over theworld. ElTangosiemprenosdeparaunasorpresa.Queunjoven holandés,sesientaatraídoporlamúsicaydanza,delRió de la Plata, como ha sucedido con él, me sonaba extraño yhastacasiunafábula,hastaqueloconocípersonalmente y comprobarfehacientemente,quehabernacidoen holanda, contodorespeto,fuéunaccidente,yaque en todosucuerpoymente,eltangoestapresente,abasede estudio,sacrificio yuna dedicación digna detodo respeto yadmiracióncomo“trabajo”,estahechoconelcorazón,esperoquesudifusióny éxitoseaentendidoy comprendido,ensu verdaderadimensión;comohagoyo, JuanCarlosCopes,queledeseaelmayordelostriunfos, entodossusciclostangueros.Fuerza,unabrazoyquesu “mensaje”,sigaconquistandoplazasy admiradoresen todo el mundo. Anorchestra oftwelve musicians. Five singers. Thedance floor: Bordello,EuropeanCabaret, BuenosAires Cabaret,DanceSalon,NeighborhoodClub. Eachartist has their own role. Eachartist is an authentic Porteño. WhatwasTangoArgentino?Whywasitsoimportant? Whocreatedit?Whostarredinit?Why didit havesuch worldwide success?Why did it stop? TangoArgentinowasthecreationoftwoverytalented theater directors and designers, Claudio Segovia and HéctorOrezzoli.Itwasthemostmagnificentshowthe worldhadeverseeninitstime,anditspenttenyears touring theworld.ItappearedinFrance,Italy, theUnited States,Canada,Broadway,Japan,Austria, Switzerland, Germany,over 52NorthAmericancities,Venezuela, Holland, England andin its homeland Argentina. Ithadsuchunprecedentedsuccess everywherethatit appeared thatawhole“tangomanía”ortango crazewas setoff. Peoplebegantogo intothestreetsandtothe theaterdressedinclothesthatmimickedthedancersinthe show.Menbegantoslicktheir hairbackwithshinygelto stylethemselvesafterthemenintheshow.Womenbegan towearlong,elegant,blackdresses withhighslits, modelingthemselvesafterthewomenintheshow.Fashion designersbegantopickuponthis anddesigned“tango- inspired”clothinglines.Voguemagazinephotographedthe castoftheshow onmorethanthreeoccasions.Famous celebrities fromall fieldsbecamewhatonecouldcall “groupies”oftheshow.LizaMinellisaw itonnumerous occasions,RobertDuvall (wholater,thankstothisshow, becameatango fanatic,and continuestodancetothis day),Anthony Quinn,Andy Warhol,PrincessDiana,and others werejust some ofthose whofellundertheshow’s spell. Apart fromthefashionandhairstyles, themost importantpartofallthiscrazewasthatTangoArgentino startedaboomofinterestintangodancing.Thousandsof peopleclamoredatthestagedooraftereveryperformance, begging thedancerstogivethemclassesinauthentic ArgentineTango.Afterholdingbackandresistingforquite along time, thedancers finally agreedandawholetango dancecrazetookofffromBroadwaytoParistoTokyo,and backto Buenos Aires wherethedancehadoriginatedbut beenforgottenandsufferedmanyyearsofneglect.Tango classesstartedupeverywhereindancestudiosanddance halls.Tangoprofessorscameoutofthewoodworkclaiming toteachauthentictango.Milongas(socialtangodances) startedupinmanycitiesallovertheworld,andcontinueto this day. Asaresultofallthisinterestintango,atremendous tangotourismbusinessstartedinBuenosAires.Intheyear 1986there hadbeenthreeAmericanswhowentto Argentinaspecificallytostudytango:RobertDuvallwasthe first,andnextwasacouplenamedAlandBarbaraGarvey, wholaterwentontobecomeimportanttangoteachersand thefoundersoftheSanFranciscotangocommunity.After 1986asteady increaseintangotourismstartedthat burgeonedintothethousands withintwoyears.Itseemed thateverycitywhereTangoArgentinowentwasinspiredby whatitsawintheshowandhadanappetitetolearnmore. AndTangoArgentino,ormoreimportantlyitsstory,is inspiring.Itisthestoryof thefightof twomen.Thefightto keepadyingartformaliveandpresentittotheworld.This is thestory ofTango Argentino. ThestoryofTangoArgentinoreallystartswiththestory ofitscreatorsClaudioSegoviaandHéctorOrezzoli.Both wereporteños,ornativesofBuenosAires,Argentina,and bothgrewupwithclosecontacttothetango.Segoviacame fromahighly artistic family andsincehischildhoodhada greatinterestinthetheater,music,dance,songandall formsofart.HegrewupnextdoortoanAndalusian flamencopeña.Manyyearslaterthisinspiredhimtocreate together with Héctor Orezzoli the spectacular show FlamencoPurowhich,likeTangoArgentino,hadgreat international success and triumphed all over the world. Attheageof20,ClaudioSegoviagraduatedfromthe EscuelaNacional deBellasArtesin BuenosAires, where hestudiedtheaterdesign,setdesign,costumedesignand otherarts.HealsograduatedfromtheEscuelaSuperiorde BellasArtes. In1965hestarted his workasatheater designer,andalreadyshowing extraordinary talentfor his craft,hedesignedthesetsandcostumes for works by Shakespeare,Victor Hugo,andIbsen, among others. However Segoviaalwayshadastronginterestin popular art formsandthisledhimtocreatein 1966the spectacularshowBagualawithMercedesSosa,withwhom hetraveled throughoutEurope,theUnitedStates andthe then Soviet Union.Segoviaquicklyconvertedhimselfinto oneofthegreatestmusic-halldirectorsinArgentinaatthe timeandhadtheopportunity toworkwithsomeofthe greatest Argentine artists of his time, such as Astor Piazzolla,ErnestoSabato,AntonioGasalla,NélidaLobato andEduardo Falu. Withthecollaborationofhis long-timeassociateand friendJorgeLavelli,Segoviaworkedformanyyearson importantopera productionintheatersacrossBrazil, Argentinaand France. Inspiteofallhis workinthefinerarts, Segovia never forgotthatlittleflamencopeñanearhischildhoodhome.In theyear1980aftermany yearsofhardworkand investigation,Segovia, togetherwithhislongtimepartner andcollaborator Héctor Orezzoli, presentedtheshow Flamenco Puroin Seville,Spain.FlamencoPurobrought togetherthemostauthenticgypsyflamencoartistsinSpain andpresentedthemusic,songanddanceonstagein its most authentic form. The finestclothes, costumes and makeupwereused,allwithoutlosingtheauthentic,“earthy” rootsofthegenre. Thiswasthebasisofall theworkthat SegoviaandOrezzolididtogether:Bringapopular,dying,forgottenartformtothestagewith its mostauthenticand truesingers,dancersandmusicians,presentahighquality showwithunparalleledcostumes,exquisitelightingdesign andspectacularhairandmakeup,andsharetheheartand soul ofthe artform andthe artistswith the world. Segovia didthisonmore thanoneoccasion.AfterFlamencoPuro debutedinSeville,it latercontinuedontotheFestival D’AutomneinParis,atour ofEurope,andover50North Americancities, including Broadway. Segoviacontinuedtheideaofshows likeFlamenco Puroandwentonto design,directandproducefourother greatmega-shows: TangoArgentino,BlackandBlue, NocheTropical,andBrasilBrasileiro.All oftheseshows always conservedSegovia’s striving anddeterminationto presentauthenticityinallhiswork.Intoday’sworld,where authenticityisscarceandalmostimpossibletofind,thatis a veryadmirable trait. WemustnotforgetthatTangoArgentinowasnot the creationofClaudioSegoviaalone.Itwasalsothecreation ofSegovia’slongtimepartner,HéctorOrezzoli.Orezzoli wasbornandraisedinBuenosAires.Orezzoliwasquitea differentchildfromSegoviaandhadadifferentway of viewingtheworld.Althoughextremelyartistic,hehada morebusiness-likewayofseeingthings.Hewas,inshort, whateverygreatartistlacksandneeds:thebusinessside oftheart, theorganizational side,thebrains.Orezzoli studiedliterature,psychologyandtheaterattheUniversity ofBuenos Aires, where he graduated intheearly1970s. Orezzolialways workedinthetheater. In1974he createdthecostumesandsetsfortheshow“Honeymoon” ofSonia Delaunay. He wentontodesign other prominent andimportant shows as well. Intheearly1970sasifbydestiny,thepathsofClaudio SegoviaandHéctorOrezzolicrossed.Itwasthemeetingof two great men, twogreatartistsandtwogreatlovers,who togetherwouldchangetheworld’sview oftheater. Together SegoviaandOrezzoliworkedonmanytheater productionsandwonmany prestigiousawards fortheir work. They wonthegrandprizeattheBiennaledeSao Paulo,thePrix Moliere,andthepremierprizefromthe FondNational desArts.In1974OrezzoliandSegovia presentedtheshowCarnavaldeVeniseattheFestivalAix- en-Provence,withsceneandcostumedesignby thetwo, anddirectionbyJorgeLavelli.In1975theytouredEurope andLatinAmericawithsomeofthegreatshows they created. In1980camethedebutofFlamencoPuro after many yearsofhardworkanddeepinvestigationintothe rootsofthe flamencoart form. Around1976Segoviabegantoying withtheideaof puttingtogetheralargescaletangoshowthatplacedallthe bestdancers,singersandmusiciansonthesamestageat thesametime.Thishadnever beendonebefore,andhe thoughtitaninterestingidea. He talkedwith afew people intheshowbusinessindustry andwasmetwithone unanimousanswer:impossible.Theyallthoughitwouldbe impossibletoconvincesomanyartists,allofwhomhadan ego the sizeoftheMoon, toappear onthesame stage at thesametime.Segovia,however,being aspersistentas heis, didnotgive up. Butnoamount ofdiscouragementwasenoughtokill theideainSegovia’s head.Hecontinuedtodevelopitin hisimagination,tweakit,perfectit.Hecontinuedwithother projectsinthemeantime,butitwasalways inthebackof his mind. WemustnotforgetthatTangoArgentino(andtherefore othershows likeFlamencoPuroandBlackandBlue)did notonlyhave thesetwo greatcreators. Therewere whole teamsofextremely talentedartists,eachoneamasterin hisorher field,whocontributedtothemagic, the excellence,thesuccess ofTango Argentino. HildaCurlettowasbornandraisedinBuenosAires, Argentina.Sheshowedsignsofextremetalentfromavery youngage. Hilda isa veryspecial, verygenerous woman. Very quiet,observant,extremely intelligentandwildly creative.Sheisawomanwhoknows how totakeanidea andmakeitreality.Shelistens,andthenshecreates.Hilda wasthecostumemakerandrestorerforTangoArgentino, aswell asBlackandBlue,NocheTropicalandBrasil Brasileira. She isbestknown forher extraordinaryworkin the fieldofvintage costumerestoration,repairandre- creation.Shehastheabilitytotakea200yearoldpieceof clothing andrestoreitintoitsoriginalformuntil itlooks as spectacularasitdidthefirstdayitwasworn.Thiswasher talent inTango Argentino. ShealsoaidedSegoviainthedesignofmany ofthe costumes and added her expertise helping Claudio select therightfabrics,colorsandtexturesforwhatwasneeded. Jean-LucDonVitowasatalentedyoung, French makeupartistandhairdresserwhoalready hadgreat experienceasoneofthetopstylistsforthephotoshootsof themajor FrenchandEuropeanfashionmagazines.He was in greatdemandtomakeuptheimportantmodelsof thetime andseldomfound himselfwithoutwork.Through arelationshipwiththeArgentinetheater directorAlfredo Arias,whoformanyyearsresidedinParis,Jean-Lucfound hisway toTangoArgentino.Arias,aclosefriendof Segovia, recommendedhimasagoodchoicetobethe makeupartistandhairdresser fortheshow. Segoviasaw hiswork,likeditvery muchandplanswereunderwayto discussthelookSegovia andOrezzoliwantedfortheir show. ClaudioSegoviaspentyearsscouringArgentinalooking for thebestdancers, singersandmusicians tobe partof hisshow. Hewentnightafternighttoall thetourist show houses,suchasCasaBlanca,Michelangelo, ElViejo AlmacénandRugantino,lookingfor thebestdancers he couldfind.With his strict eyefor talent andhis knowledge ofwhathewanted forhisshow, afteryears ofcareful scouting Segovia found what andwhohewanted. Well, 7yearslaterSegoviawent backto seeCopes, told himthat hisprojectwasa realityand that it was going tohappen, andthathewantedJuanCarlosandMaríato beamaincoupleintheshow.HealsocalleduponJuanto bechoreographer ofthegroupnumbersoftheshow, as well asthefinaleandanumberofthesolopieces.Juan agreedandbegantoworksidebysidewithamanwhojust a few years before he hadthought was crazy. Copesquicklyrealizedthatthismanwasnotcrazy,but ratherageniusandavisionarywithamagnificentideaand conceptsthatwereaheadoftheir time.Forexample,for thesceneofLaCumparsita,whichwastoshowtango as it wouldhavebeendancedinParisin1913,astherewere nodocumentsorfilmsofthewaytangowasdancedatthat time,SegoviashowedCopesmany oldvintageFrench postcardsoftangocouplesposing.Copeslaidthemouton thefloorwithSegovia,arrangedthem,rearrangedthemin adifferentorder, and fromthose poses,with afew linking steps, the choreographytoLaCumparsitawas born. 1971 inthetango showbusiness. Theyhad appearedon stage,ontelevisionandinthetheater withthebest orchestrasandsingers,andthey hadtheir ownballetin largeandimportantcabaretssuchasKingandRugantino. Theywerewellknown fortheirhigh speeddancing and theiracrobaticsteps,whichwereunusualforthattime,but allthiswouldsoonbechangedbySegovia,ashewas looking for adifferent kindofdance for hisshow– a more elegant, dignified,respectful danceonthe floor. CarlosandMaríaRivarolawerethenaddedtothecast, eventhoughtheywereconsiderablyyoungerthantherest ofthoseinthecast.Carloswasconsidered(andisstill consideredtothisday)tobeaveryphysically attractive andbeautifulman.Hewastallandelegant,withextremely strong facial featuresanddark,slanted,almostAsian- lookingeyes.Hewasquitestrikinginhisappearance,and hiswifeMaríawasevenmoreso.Withherlong legs, shapelydancer’sbodyandpiercingblueeyes,itwasawell knownfactthatMaríausedtocausetrafficaccidentsonthe streetsofBuenosAires,astheeyesofallmale(andsome female)driverswereonherandnotonthetrafficwhenshe crossedthestreet! Carloswastodanceoneofthemainrolesintheshow, LaCumparsita,withathen-famedvedetteshowgirlnamed CeciliaNarova.SegoviahadworkedwithNarovainvarious revistasporteñasthathehaddirectedintheTeatroMaipo withAntonioGasalla,NélidaLobatoandothergreatartists. Inlate1982whenLobato,thetopshowgirl atthetimein Argentina,becameillanddiedunexpectedly,Cecilia,who was adancer inthechorus, was calledin toreplace her. ThiswasaveryimportantstepforCecilia,andonethat couldhaveshothertohighfame.Butshortly afterher promotion,Segoviacalledherforhisnewproject.Shewas exactlywhathehadimaginedfortworolesinhisshow:the elegant, high class, Parisian salon dancer in La Cumparsita,andthedark,morocha,girlofthebarrioturned prostituteforMilonguíta. Narova wastodanceLa CumparsitawithCarlosRivarolaandMilonguítawithMaría Nievesandallthemaledancersintheshow.Narovafither roletoa“T”,anditbecameoneofthemostrecognized roles ofher career. Thenext coupleaddedtothecastwas Mayoraland Elsa María. Bothwerealreadyverywell known dancersin Argentinaandabroad,butnotsomuchinthetouristshow market as weretheother dancers. Mayoral hadhis own balletformany years,theInstrumentalBallet,inwhichall themembersdanced,sang andplayedamusical instrument.Theballethadgreatsuccessinthe1970sand traveledalloverSouthandLatinAmerica.Itwonmany importantprizesandawardsandappearedatallthemajor festivals.Mayoral and Elsa María also had filmedaseries oftelevisionprograms that taught simple salóntango. Theseprogramswerebroadcastallover SouthAmerica andnotonly helpedto spreadtango dance tothegeneral public, butalsohelpedMayoralandhiswife togain recognitionona grander scale. Thestyle ofMayoral andElsa María was that oftango salón,averysimpleyethighlydignifieddancefullofsmall, playfulmovementsbyMayoral.Mayoralhadatremendous senseofhumorandplayfulnessinhisdance,andthiswas adelighttosee.Insteadofthetypicalstiff,straight-forward tangothat was popularat the time, hiswas adance full of character andpersonality. GloriaandEduardohadoriginally beencalledby Segovia,butbecauseGloriawasabouttogivebirthtotheir firstchild,travelingonalargetourwasnotanoption.Their timewouldcomeonly ashortyearlaterwhenthey would join the show for a secondtour. ameetingwith them.After long negotiations,theDinzels decidednottodothetour. Segoviadidnotwanttogive thema solo number to dance. They were to be like all the otherdancersanddanceaspartofanensemble.Theonly solosweregiventoCopesandNieves,NélidaandNelson, andMayoral andElsaMaría.TheDinzels,especially Gloria,didnotlike thisonebit,andbothturneddown Segovia’s offer. Theytoo,likeGloriaandEduardo,would have asecond chancea year later tojoin theshow. Ayoung couplewasneeded,soSegoviacalledon MónicaCandaandLucianoFrías.MónicaandLuciano, althoughbothonlyintheir mid-twenties,hadalreadybuilt animpressivecareer. They bothhaddancedintheballet ofCopes,performedonimportanttelevisionprogramssuch asGrandesValoresdelTango,touredColombia,Brazil, Chile, performed with orchestras like the SextetoMayor andSextetoTango,andstarredintheshows ofthevery important Argentine actor Hugo del Carril. Mónica andLucianowere well known on the scenefor twothings:hisextremephysicalbeauty,andherstrong appearanceon stage. Luciano was famousfor his slicked backblackhair,whichwhenwelldonegavetheimpression ofanextremelyreflectivemirror.Itwasquiteasighttosee, andnoothermaletangodancerafterhimhasbeenableto replicatethelook.Mónica,ontheother hand,wasan unusualbeauty. Althoughshedidnotpossessthetypical “dancer’s body”, shehad apair ofeyes that could light up thelighthouseofAlexandria!Withherlong,curly hair, amplebosomandshapelylegs,shewasjustwhatSegovia was looking for. Sothey were in. Onemorecouplewasmissing.Segoviahadseenevery majorandminortangocoupleinBuenosAiresbuthadnot found that last couplehe needed. One day, speaking with Nelson,Nélidasaidtohim,“Andthatlargemanthatisyour friend.Whatis his name?Theonewhowe sawdanceon thestreetforpennies?Whereishe?”That“large man”of course wasVirulazo.Nelsonlikedtheidea verymuchand setoutwithafriendtosearch forVirulazo andhiswife, Elvira. FinallyNelsonconvincedVirulazotodoit.Sooneday, whiletherehearsalsfortheshowwerewellunderway, NelsontookVirulazo andElvira toElViejoCaféNacional wheretherewasasmall stagewheretheauditionwasto beheld. JoséLibertellawastherewithsomeofhis musicians,andSegoviawasintroducedtoVirulazoand Elvira.Hewasextremelyskepticalatfirst.Virulazoand Elvira were not thetypical image ofa tango dancer. They were not thetypicalimageofanykind ofdancer! Virulazowaswelloversix feettall,toweredovermost averagedsizedpeopleandwasoverweightby about120 pounds.He,likemany Argentinesofhisgeneration,lived onadietofasado(barbecuedbeef),beerandcigarettes. Elvira,ontheotherhand,wasover sixfeettallaswell, slender,sinewy andmuscularwithlong,thinlegs,long armsandasomewhat “handsome” face.Withhershort, boyish,blackhair,“feminine”wasnotawordthatdescribed her well. Segoviawasextremelyhesitantandhadhisdoubts,but heagreedtoletthemdance.He askedthemwhatsong they would like and Virulazo said, “Tanguera”. The orchestraplayedTanguera,theydidtheirbest,butit was notthebest auditionofall time. It simply was not theright musicalchoicefortheirpersonality.SoSegoviaasked themtodoanotherone,andthistimeVirulazochose OrgulloCriollo. Themusic started,Virulazo andElvira danced,and everyoneinthecaféfroze,stoppedwhattheyweredoing, approachedthestage,andstood there mesmerizedas to whattheywereseeing.Themusicended,andSegovia,in shock,stood up,applaudedwildly, andhiredthemonthe spot. “El Gordo” fromSanJustowasabouttodebutin Paris. Thereare,ofcoursemany dancecoupleswhowere bendingover backwardstogetintotheshow atthattime. Itisknownthatayoung bricklayernamedMiguelÁngel Zottoattemptedtojointhecastin1983,butwas turned down, aswereother prominent couples suchasLos de Cobre,Los del Plata, Marinel andothers. Withthedancingcouplesalreadychosen,anorchestra andamusical director neededtobe found.Segoviahad originally spokenwiththelegendary bandoneónistAníbal Troilo“Pichuco” tobemusicaldirector oftheshow, but shortlyafteronthe18thofMay 1975,Pichucopassed awayleavingbehindhimanunforgettablemusicallegacy. Next SegoviaspokewithAstorPiazzolla.However, Astor startedputtingconditions:Hewouldonlyplay in the showifallthemusicalpieceswerehisown.This,ofcourse, wasimpossible,astheideaoftheshow wastotakethe audienceonajourneythroughthehistoryoftangoandthe evolutionofthegenre.Piazzollaalsowasoverlyanxiousto finalizeeverythingandsignacontract,anotherimpossible condition,asSegoviahadnotcompletedthedesignof his show, letalonethecasting ofartists.Hehadnoteven writtenhisowncontract.Segovia decidedagainstit,and Astor wentonhis way. 1981. AtthistimeClaudioSegovia, whohadbeenliving andworkinginParisformany years,gotwordofthisnew orchestraandwenttohearthem.SegoviaspokewithJosé Libertella,whotogetherwithLuísStazowasthedirectorof theorchestra.TheSextetohadagreatrepertoireandcould give Segovia whathe needed, so it was agreedtoinclude theminthecastoftheshow. Discussionsgotunder way andSegovia explainedtoLibertellahisideatopresentall themusical stylesandtimeperiods oftango fromthe earliestMilongastothemostmoderncompositionsofAstor Piazzolla andHoracio Ferrer. Fromtheverybeginning mostofthemusical arrangements were adaptedbyJosé Libertella. Libertella, whowasborninItaly,butmovedtoArgentinawhenhewas onlyafewmonthsold,.Hewasvery wellknownforhis talentasamusicalarranger.Segoviahadalreadybeento seehimin1976whenheoriginally wantedtodebuthis show.InitiallySegoviawantedthegreatAníbalTroilotobe musicaldirectoroftheshow andtohavehisorchestraon stage. However duetoTroilo’sdeathin1974,thiswasnota possibility.Aninterestingnoteisthateachperformanceof TangoArgentinobeganandendedwithQuejas de Bandoneónasahomagetothegreat“Pichuco”. Mostof themusicalarrangementsintheshow arethoseofTroilo thatLibertella“adapted”,butbasicallythey arethe arrangements ofTroilo. NextSegovia calledHorácioSalgán,amagnificent tangopianistandcomposerwhoplayedinasuccessful duowithUbáldodeLío.SalgánanddeLíohadplayed togetherintheTrottoirs deBuenosAiresinParisin 1982 andcausedsuchasensationthata liverecordingofthe concertwasmade.TherearestillParisianswhotothisday vividlyremember thoseconcerts.Salgánwasandforever will bealegendinArgentinemusicalhistory,writing such songsasAFuegoLento,ADonAugustínBardi, and Oratorio Carlos Gardel. Salgánhadanextremelymodernstyleforthetimeand hadbeenpartofmanyimportantorchestras,suchasthose ofRoberto Firpo,EdmundoRiveroandothers.In1960 he hadcreatedtheQuintetoReal, whichhadtremendous successallover theworld.Helatercreated theNuevo QuintetoReal, whichhadeven greater successthan the first.UbáldodeLíohadalways playedinduowithSalgán inalltheirconcertsandrecitals.They bothhadrecorded many Long Play recordsandcassettes,andtheir music wasknowntheworldover,especiallyinJapan wherethey hadalargenumberoffollowers. Bothwereaddedtothe cast.